Strakka Racing has agreed a long-term sportscar partnership with DOME, in which it will work together to develop, bring to market and race a brand new 'cost-capped' LMP2 coupe prototype endurance race car – the Strakka DOME S103. 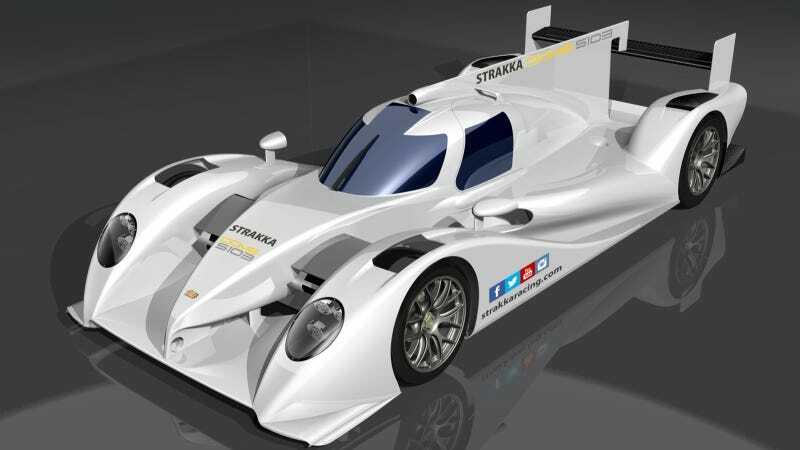 The first Strakka DOME S103, which will be powered by a Nissan VK45 4.5-litre V8 LMP2 petrol engine, will contest the entire FIA World Endurance Championship next year, pending approval of the Selection Committee. Silverstone-based Strakka Racing has a rich history in sportscar racing, having contested the Le Mans 24 Hour race for the last six consecutive years – winning the LMP2 trophy (and finishing a record-breaking 5th overall) in 2010 and the LMP1 Privateers' award in 2013. In 2012 Strakka Racing was runners up in the LMP1 Privateers' class in the FIA World Endurance Championship and finished as LMP2 runners up in 2010 and 2011 in the European Le Mans Series. DOME was established in 1975 by Minoru Hayashi, and over the last 38 years has become a leading racecar constructor and motorsport competitor. Based in Maibara, Shiga Prefecture in Japan, DOME made its Le Mans 24 Hour race debut in 1979. Utilising DOME's 50% wind tunnel (which it has run since 2000), CFD expertise and lightweight technology, the Strakka DOME S103 promises to be one of the most aerodynamically and advancedLMP2 cars on the grid. Dan Walmsley, Strakka Racing Team Manager: "Our new partnership with DOME signals an exciting new chapter in the history of Strakka Racing and reinforces our commitment to sportscar racing. Following the difficult decision not to compete in the remaining races of the 2013 FIA World Endurance Championship, we've focussed on the engineering challenge of building and testing a brand new car ahead of the start of the 2014 season, with the opening race of the WEC only five months away. It's a very tight schedule, but between Strakka Racing and DOME, we're confident we have the best team of skilled engineers to hit our targets and to debut a fast, reliable and competitive car." Hiroshi Fushida, President of DOME: "We are delighted to team up with Strakka Racing, in a partnership that will enable our cutting-edge designed S103 become reality and race on tracks all over the world. Strakka Racing's results at Le Mans and performances in both the Le Mans Series and World Endurance Championship racing have impressed us, and our joint sportscar racing expertise will enable us to maximise the car's full potential. We are confident the Strakka DOME S103 will become a very competitive and desirable cost-capped LMP2 race car." Nick Leventis: "Following the success Strakka Racing has achieved in sportscar racing, this partnership with DOME isan important and logical next step to develop the Strakka team as a global motorsport brand. It wasn't an easy decision to withdraw from the remainder of the 2013 World Endurance Championship and we'd like to thank WEC and the Automobile Club de l'Ouest for their understanding. Now, we're looking to the future and the challenge that lies ahead of us, and we're confident that the development we have planned for the Strakka DOME S103 demonstrates our future commitment to the FIA World Endurance Championship."